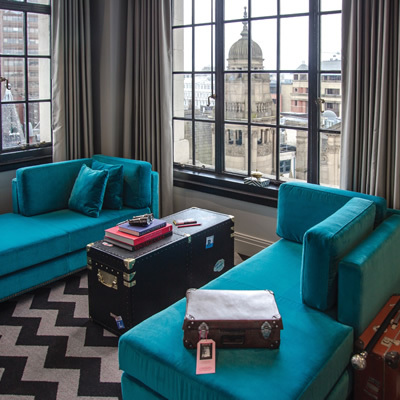 Hotel Gotham can be found located in Manchester’s city centre. It’s located inside a huge, unassuming building with just a small entrance. As you enter, there are a couple of lifts that take you up to the reception area on the 7th floor. After a friendly and swift check-in, we were soon on our way to our Gotham Suite. The suite itself was of a good size and offered a separate seating area, as well as the super king-size bed. The décor of the suite is quite opulent, with the bed boasting a black leather bedhead and faux fur bed covers. Our suite also had zig-zag patterned statement carpet, which was quite a focal point. In the way of amenities, you will find slippers and a soft waffle robe, as well as a mini bar, espresso machine and a flat screen television. 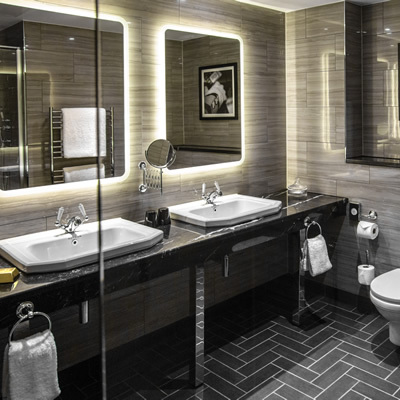 The bathroom is perfectly functional and finished to a very high spec. 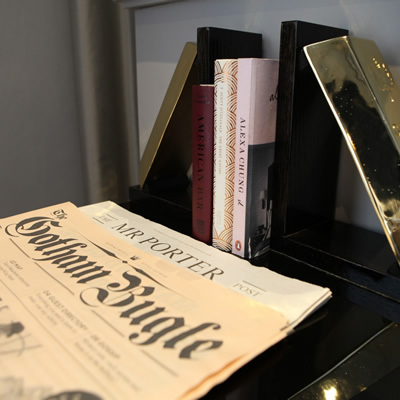 In the hotel itself you’ll find plenty to keep you occupied, including Gotham’s own private members club – Club Brass. This Prohibition-style, speakeasy style bar is open only to members and those staying at Hotel Gotham, and can be found through a set of vault doors on the 7th floor of the building. You can expect a menu of tempting cocktails and a wonderful selection of Champagne. It’s certainly worth a visit during your stay. 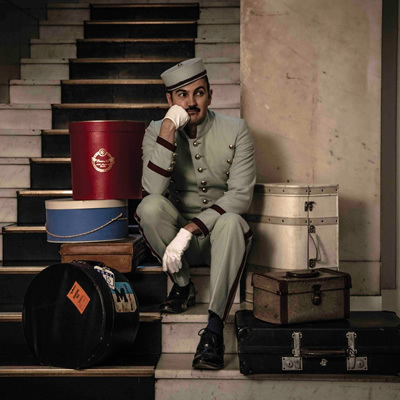 Throughout the hotel you can’t fail to noticed the dapper-dressed members of the team. The Gotham has gone all out in ensuring an authentic feel to the 1920’s New York vibe, with everyone from the bell boy to the waiters being suitably dressed to impress. The restaurant at Hotel Gotham - Honey, with a 2 AA Rosette award to boot. Manchester in general has a great foodie scene, and Honey is sure not to disappoint should you find yourself a little peckish during your stay. We absolutely adore Manchester as a fantastic place for a city break. 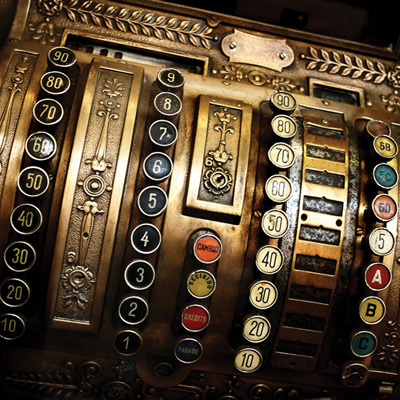 The shopping, bars and foodie scene are amongst some of the best in the country, and the general culture of the city is a wonderful thing to experience. The location of Hotel Gotham means it’s perfect for exploring all the sites, and we absolutely recommend checking out what the city has to offer when visiting. 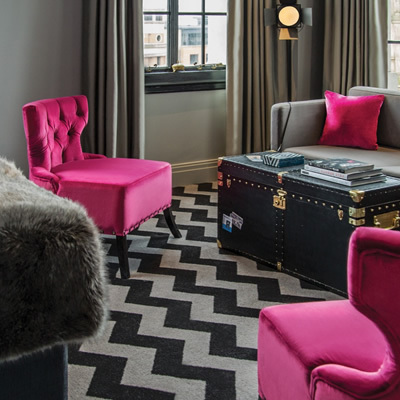 We thoroughly enjoyed our stay at Hotel Gotham, and cannot fault our experience. We absolutely loved everything from the concept, to the location and the interiors. If you’re visiting Manchester and fancy something a bit different, then it comes highly recommended by us as a strong contender.